Poetry Club: This week for Poetry Club we have a few challenges! Write a stanza, an incomplete poem, and we’ll trade them at Poetry Club so that someone else can pick up where you left off. Write a poem about something you wish you could experience – an event or era you want to be a part of. Use imagery to describe the scene. Must present documentation that you are playing for a collegiate institution (i.e a letter of intent from the school you are going to attend, something that states you are going to compete for a collegiate institution on official school letterhead). Documentation should be to the Activities office by 3pm on Friday, May 11th to be included in the ceremony. 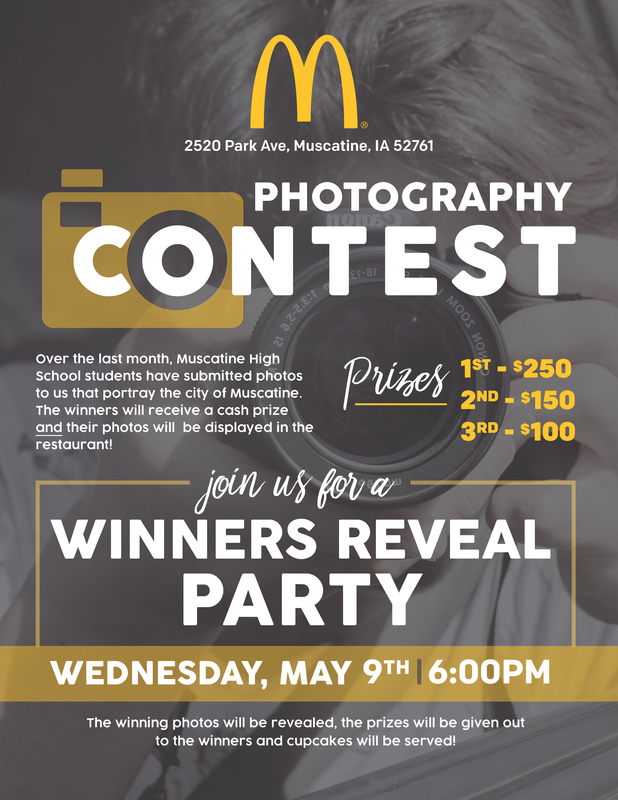 This is an opportunity for us to recognize your excellence as a student athlete while at Muscatine High School, and to recognize you as compete at the next level. 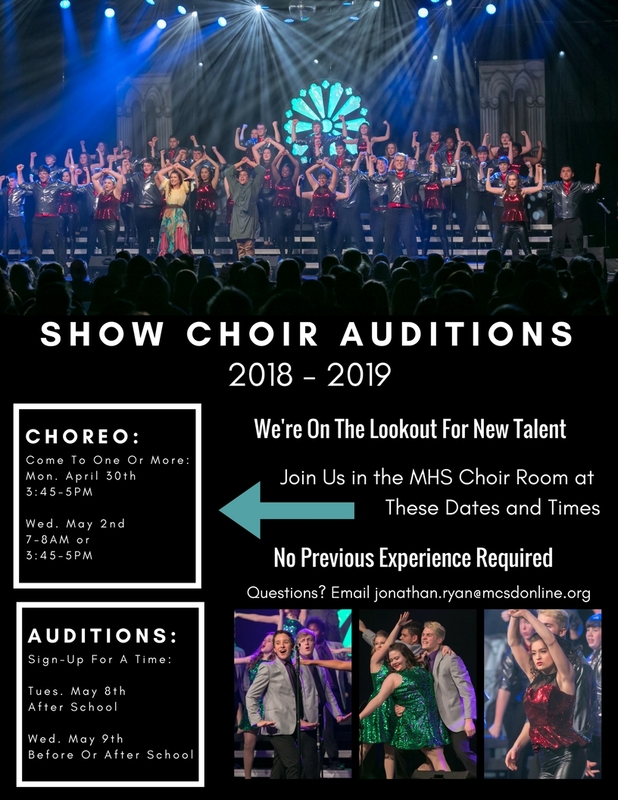 Show Choir Auditions – No Previous Experience Required! We’re on the Lookout For New Talent! Support MHS FFA – get frozen custard at Culver’s this THURSDAY, May 3rd. 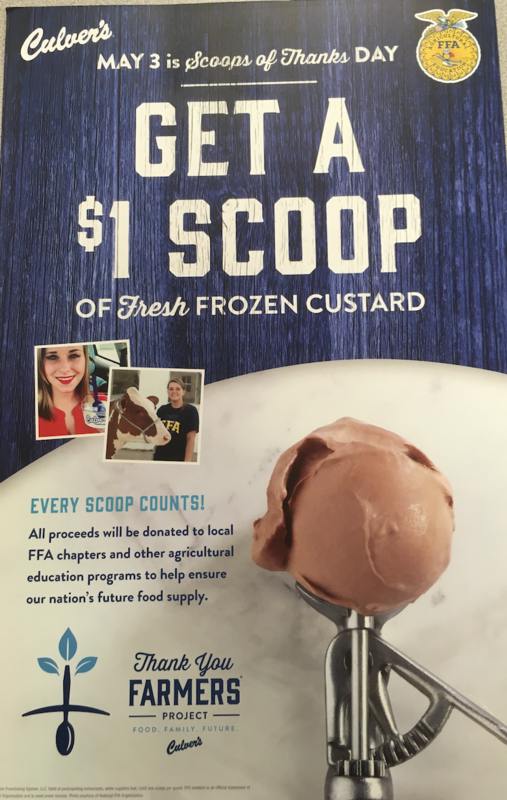 Get a $1 scoop of fresh frozen custard and all proceeds will be donated to local FFA chapters and other agricultural education programs to help ensure our nation’s future food supply. The City of Muscatine Public Works is seeking a candidate for a Civil Engineering Tech Intern for the summer. The hours will be approx 8-5 most days, maybe some Saturdays if there is a big project going on. A job summary and application is in Student Services. Intern would also be able to work during Thanksgiving break and Christmas break. Even if the applicant does not have all the certifications, they want you to apply anyway. Summer Employment Opportunity: Corn Detasseling – Must be 14 years old by June 26, 2018. Workers will need to attend a safety meeting June 26th from 5:45-8:00 pm at MCC . Applications are available in the Student Services Office. US-China Study Abroad Summer Scholarship Opportunity: 4-week opportunity to study abroad in China this summer. nterested in scheduling a college visit? Go to the website of the college/university you are interested to schedule an individual visit. Stop in the Student Services Office and see Ms. Milani if you have any questions or would like assistance. Volunteers Needed for Muscatine Humane Society Event-CA$H for KRITTER$: May 4 , 5 & 6. Wesley United Methodist Church is holding a carnival on Friday, May 4 from 4-6pm for the students at Franklin Elementary. Volunteers are needed to run games. 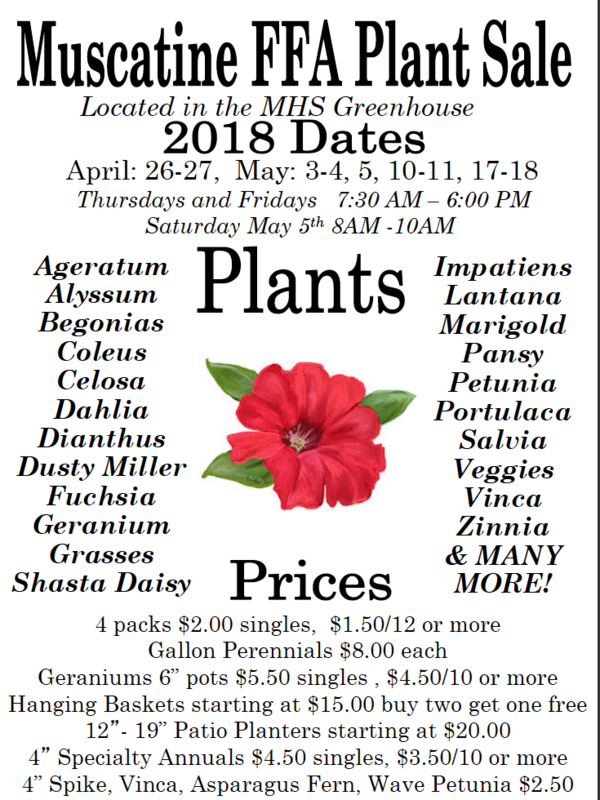 If interested, please contact Sonia Baker at soniabaker@wesleyonline.org or 563-299-8267.